We’d love your help. Let us know what’s wrong with this preview of What Does the Cross Mean to You? by Corville Peters. What Does the Cross Mean to You? A Twenty-One Day Journey to Wholeness is author Corville Peters' invitation to embark on a path of discovery. Each day you will explore a benefit and/or blessing available to you at th Are you living your faith to its fullest? Are you experiencing God's perfect love, perfect forgiveness, perfect freedom, perfect hope, and perfect acceptance? 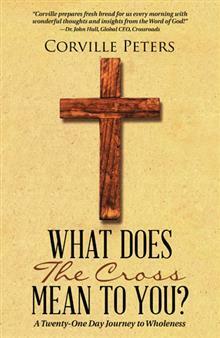 To ask other readers questions about What Does the Cross Mean to You?, please sign up. Be the first to ask a question about What Does the Cross Mean to You? I won this from Goodreads, but having read it, now wish I hadn't entered that particular giveaway. At first I thought it was just the language that I didn't enjoy; the used car salesman tone and the Christian jargon that can be confusing, off-putting, and sometimes condescending for those who have not grown up in that world. While I had no difficulties understanding what Peters was saying, it bothered me to think that other people would have difficulties. The more I read, the less I liked. This I won this from Goodreads, but having read it, now wish I hadn't entered that particular giveaway. At first I thought it was just the language that I didn't enjoy; the used car salesman tone and the Christian jargon that can be confusing, off-putting, and sometimes condescending for those who have not grown up in that world. While I had no difficulties understanding what Peters was saying, it bothered me to think that other people would have difficulties. The more I read, the less I liked. This is not a Biblically sound book, even though it is full of Bible verses. Many are taken out of context in order to support Peters' message, and yes I do mean this is Peters' message. Looking back, the sub-title of a "twenty-one day journey to wholeness" was the red flag I missed. The entire book is based on the sad and false idea of a prosperity gospel. 21 days in this book will not result in riches and health and happiness etc etc etc. It will not mean you have reached the apex of your spiritual journey. You will not be "done". Only once did he acknowledge that this might be the beginning of someone's journey; one line slid in as an afterthought. I freely admit there are some sound messages and principles here, but more often than not they were used as the jumping point for the western ideas that we know better than God, that He exists to make our lives wonderful, and that all we need to do is believe and we'll live happily ever after. I received this book for free via Goodreads First Reads. I have read and learnt from previous books on a similar theme. I did not learn or enjoy this one. The tone was dour and it was a chore to read. I felt the author had little enthusiasm for the topic and religion in general. I also wondered why he switched Bible versions even in the chapters. Overall I had to give it 1 star and no recommendation. I must say this book is great, I loved it and now my husband is reading it as well. I would recommend this book to everyone as it is very encouraging and helpful, it gave me a better understanding of the cross and its significance not only in the past but in the present and future as well.